Under President Donald Trump, the United States’ stance toward China has been shifting in both tone and policy. Due in part to the Trump Administration’s nationalistic “America First” views, and in part to genuine concern about an increasingly authoritarian and increasingly ambitious China led by President Xi Jinping, these shifts have real implications for companies doing business in America. In addition to legal and financial strategies, companies seeking to mitigate potential new developments in this area need to consider their public affairs and media relations strategies as they prepare to navigate the shifting sands in Washington, D.C. and Beijing. This newly created tension between China and the U.S. will continue to produce conflict on many levels—especially since China has spent decades on its global “soft power” campaign, designed in part to project and encourage positive views of Chinese society, and in part to mitigate the “China threat thesis”—the fear from neighboring countries and the West that as China’s economic power grows, China will try to achieve control of its region through military aggression. With this in mind, China has invested heavily in developing countries as well as in student and cultural exchange programs in the U.S. and numerous other countries, and made substantive strategic investments in global media outlets (e.g., Xinhua, China Daily, China Watch, Global Times). However, these efforts are undermined by an increasingly jarring juxtaposition with the steps China has taken under President Xi Jinping to consolidate its military and economic might into one rapidly growing industrial force. The country is also working on many fronts to become a dominant technological power, and President Xi’s recent move to abolish presidential term limits is another troubling step toward authoritarianism. Even the more gentle Chinese soft power attempts are backfiring in the U.S. Consider the recent testimony before Congress from FBI Director Christopher Wray, who said that Chinese academics in American universities pose a national security threat—that they’re “exploiting the very open research and development environment we have,” and that the U.S. intelligence community is trying to “view the China threat as not just a whole-of-government threat but a whole-of-society threat.” This statement reflects an increasingly common American attitude that China is intent on surpassing the U.S. in a race toward economic and technological superiority, and the U.S. must guard against this vigilantly. For these same reasons, Chinese investment in American technology companies has come under increased scrutiny from this Administration. Some experts believe Chinese investment is a direct attempt to “steal” technology from the U.S. to build its own military capabilities, posing national security concerns for the U.S. Private Chinese companies are not exempt from these concerns; many experts point out that in China, the government exerts such a degree of control that even private companies have very little ability to protect information or decision-making from the state. We are seeing a clear backlash against China building in the U.S. In fact—despite American wariness about a merging Chinese economic and military industry—the Trump administration has begun using national security as a rationale for economic decisions. Following through on his “tough on trade” and “tough on China” rhetoric, President Trump imposed tariffs on washing machines and solar panels from China, and he imposed steel and aluminum tariffs which were initially intended to apply to all countries but are broadly seen as aimed at China. More recently, Trump has also announced tariffs on around $50 billion worth of Chinese imports, which he says is in response to technological intellectual property theft on China’s part. China has announced some retaliatory tariffs already, and more are likely to follow in what experts are concerned could become a destabilizing global trade war. Before any of these tariffs, new legislation had already been introduced in both the Senate and House—with bipartisan support, which is meaningful in the current political landscape—which would overhaul the Committee on Foreign Investment in the United States (CFIUS). CFIUS currently reviews transactions where a foreign company purchases a controlling interest in an American technology company, and CFIUS has the authority to recommend the president block any deal that could have national security implications. We’ve already seen an uptick in transactions blocked by CFIUS. Under the new legislation, known as the Foreign Investment Risk Review Modernization Act, or FIRRMA, CFIUS’s authority and jurisdiction would be greatly expanded. If the new legislation were to become law, non-controlling but non-passive foreign investment in “critical technology” companies would require CFIUS review, as well as joint ventures and real estate transactions near military facilities. The first version of FIRRMA is currently under review, and many observers now see it as very likely that a version of this punitive legislation will pass in 2018, directly reducing opportunity for Chinese investment in the United States. Beyond this expansion of CFIUS, there is now talk that Trump may even use national security grounds to entirely prohibit all Chinese investment in particular technology sectors, by exercising authority under the International Emergency Economic Powers Act of 1977. Given all these developments, companies would be wise to prepare for a continued escalation between China and the U.S., not just from a business standpoint, but also in terms of public affairs, relationship building, and communications to key stakeholders. An increasingly ambitious Chinese superpower and an increasingly nationalistic United States are on a direct collision course. 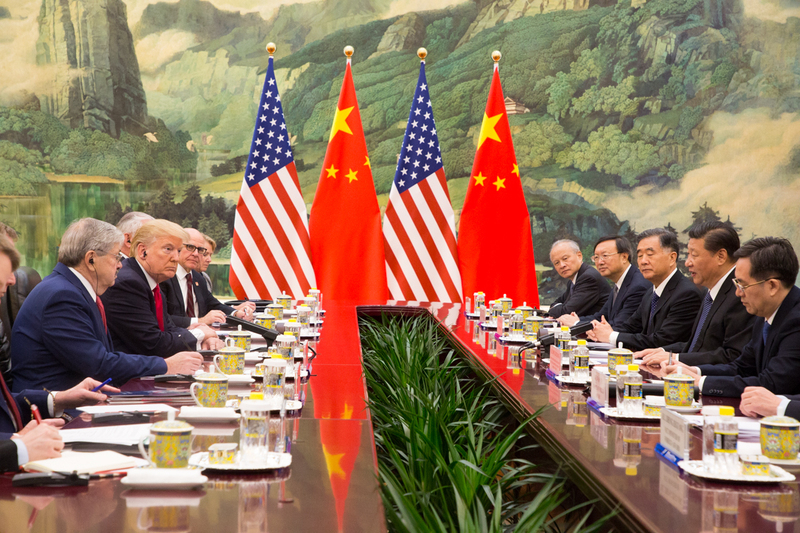 Where U.S.-China relations are headed, and whether the U.S.’s responses will help or harm the American economy and individual businesses within the U.S., remain to be seen. But it is quite clear that global trade and power dynamics are in a time of transition with seismic change possible. Business leaders must consider how to best position themselves and their companies to weather potential upheaval, and KARV will keep a close eye on these emerging developments so we can continue to offer insightful, strategic public affairs and communications counsel for all contingencies.